It’s definitely the end of the month—time to stretch my creativity by cooking with a limited set of resources! I’ve been doing a lot of freezer diving over the past few days, and last night’s dinner was no exception, but around here, fresh produce usually ends up being the star. Among the little fresh produce I had left was a ruddy head of treviso radicchio, and I decided to build our dinner around it. 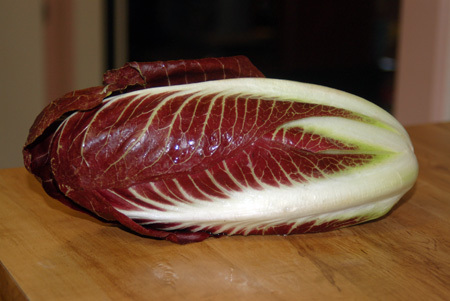 Being a chicory, radicchio is quite a bitter vegetable, making it a good accent for salads. It also mellows somewhat if it is cooked, and is hearty enough to hold up to braising, grilling, or roasting. I cut half of the head into long wedges through the root end, which held the leaves together (the rest went back in the fridge for another meal). After a brief marinade in a garlicky balsamic vinaigrette scented with rosemary, I roasted my wedges until the stems were tender and the edges were crisp, and grated a little Parmesan over the top as they came out of the oven. We had a few rockfish fillets in the freezer saved from earlier in the month, so, fitting into the pseudo-Italian theme of the night, they went on the menu simply dredged in a little flour and Parmesan and baked in the oven (yes, I am aware of the fish+cheese=BAD rule, but I’m a rebel, lol). To tie in with the radicchio further, I dragged the fillets through the balsamic marinade before coating them. But it still felt like the meal was missing something—starch. We were out of potatoes, rice or quinoa didn’t feel appropriate, and pasta felt like too much work. I started thinking a bean puree would work nicely, since cannellini beans are a natural Italian pairing with radicchio. But this would have necessitated advance planning, since I cook all my beans from a dry state now rather than buying cans. Fortunately, I had some cooked black-eyed peas in the freezer, doled out in 1-cup portions. I dumped them from the baggie straight into a pot of chicken stock to thaw and break down a bit, along with a few tablespoons of frozen leek slices, a pinch of rosemary, and a big scoop of balsamic-infused minced garlic saved from the radicchio marinade—that flavor really informed the whole plate. Once the beans started to fall apart, I ran my immersion blender through it and gave it a little while longer to thicken up while the fish finished cooking. It didn’t make for an exciting photograph, but the whole dish worked really nicely. The crust on the rockfish had good flavor eve if it didn’t crisp up as much as I would have liked—next time I’d pan-sauté it instead of just chucking it in the oven next to the radicchio. The black-eyed pea puree looked like spackle, but tasted garlicky and smooth, with occasional hints of piney rosemary and tangy-sweet balsamic. It paired perfectly with the roasted radicchio, which retained a remnant of its bitterness through the acidic marinade. Jeremy saved his radicchio for last and found it too bitter. I ate bites of everything together and the flavors balanced nicely, with the strongly flavored radicchio elevating the milder items. Place the vinegar, olive oil, rosemary, garlic, salt, and pepper in a large bowl or Ziploc bag and mix well. Add the radicchio and gently toss so that it is well coated. Cover and let marinate at room temperature for about 1 hour. Preheat the oven to 425F. 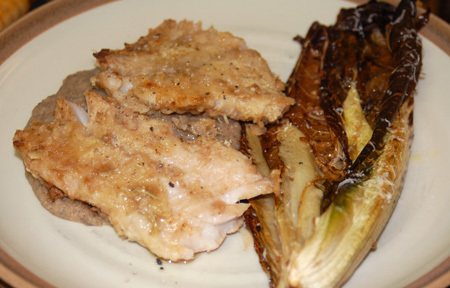 Remove the radicchio from the marinade and arrange it in a greased baking pan. (I used the remaining marinade to season my bean puree and dredge my rockfish fillets.) Place in the oven and roast until the edges of the radicchio are crisp and almost beginning to look burnt, about 20 to 25 minutes. Grate Parmesan cheese over top as it comes out of the oven. Can be served hot or room temperature. Source: Adapted from Todd English on Good Morning America.